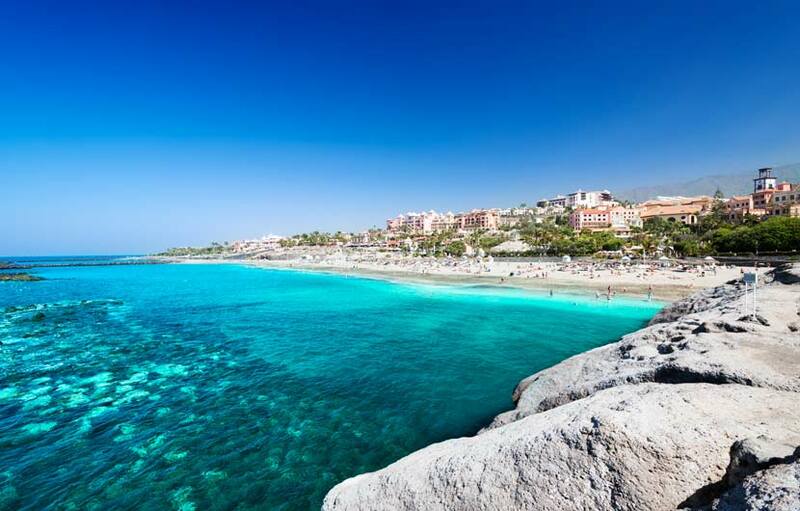 For all foodies looking for a fun and interesting introduction to Spanish gastronomy, cooking classes Spain are a must thing to do. 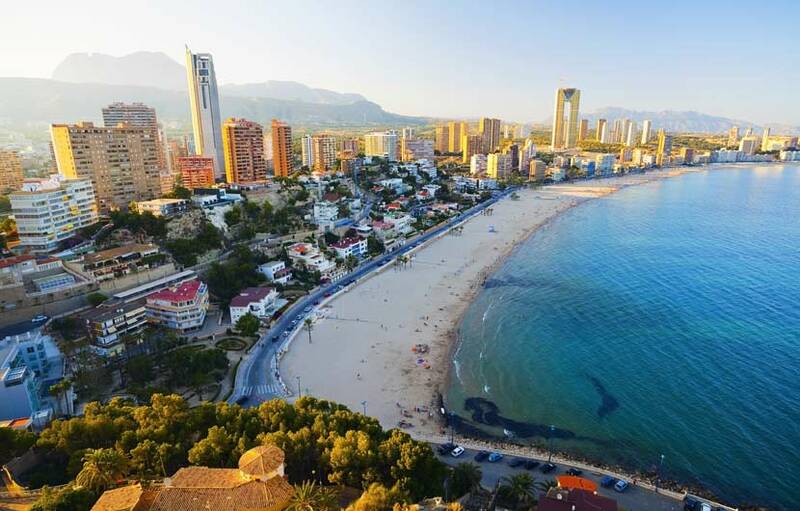 Cooking in Spain via programmed cookery courses has never been so accessible as there are now a number of first class cooking schools and home based chefs where you can learn how to cook many of the most popular Spanish classics such as Paella, Tortilla, Seafood Rice and much more. 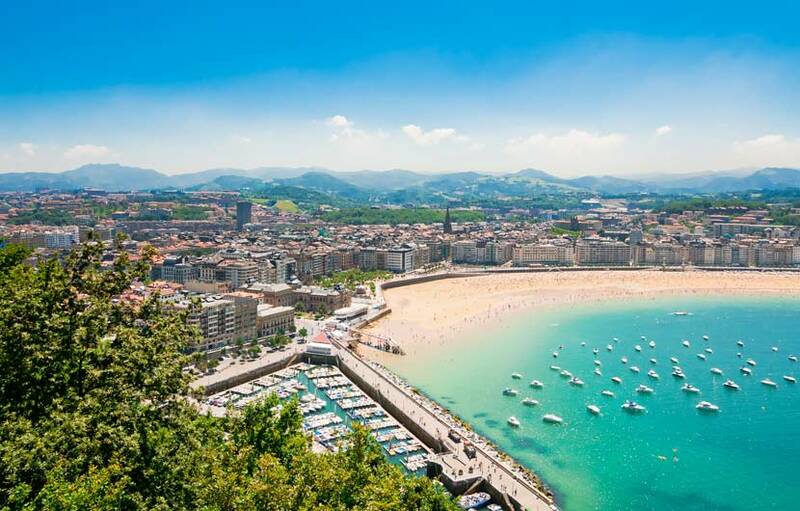 Professionally organised Spanish cookery classes and gastro tours Spain allow you to book a cookery class which suits you, from a 2 hour tapas class in Barcelona to a full 3 to 4 day comprehensive cooking holiday in Spain. 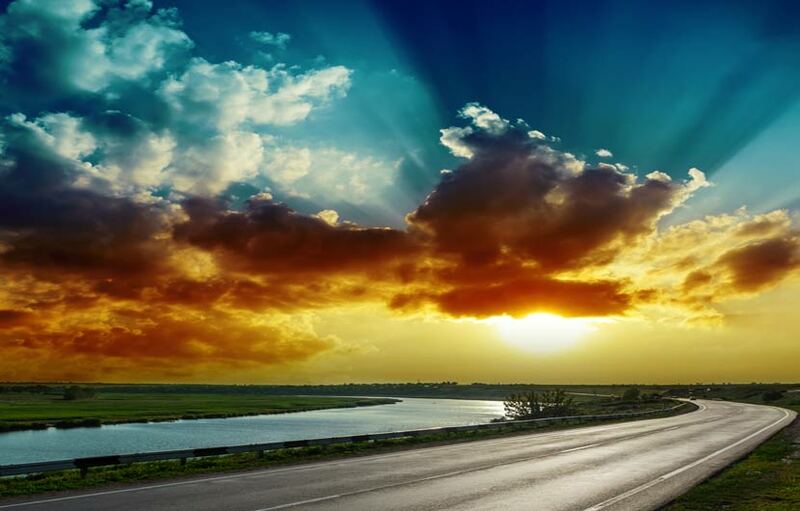 Many cookery courses are held in quaint rural settings as well as vibrant city locations. Cookery classes are also fun and exciting and a great way to meet like minded people. 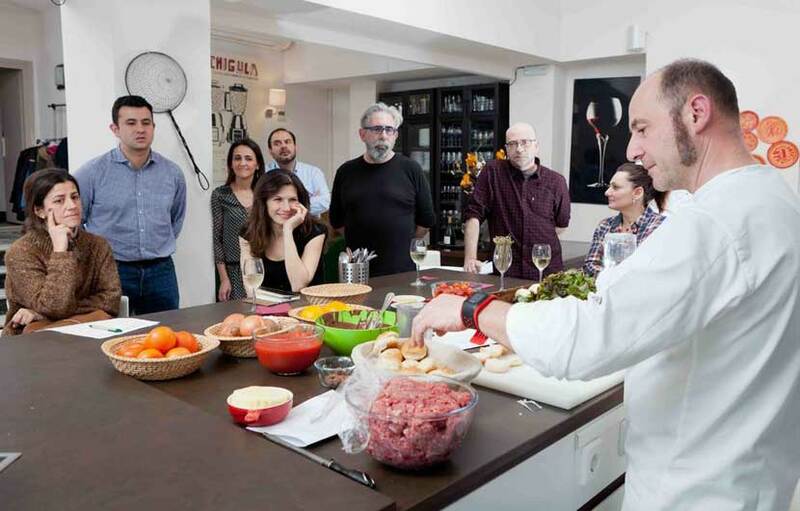 At Madrid Tapas Trip you can learn how to cook and prepare traditional Spanish dishes in a 3-hour cooking class in Madrid. Get all the tips and secrets on how to prepare a traditional paella, tortilla (omelet), and sangria whilst learning the history and techniques used in a Spanish kitchen. 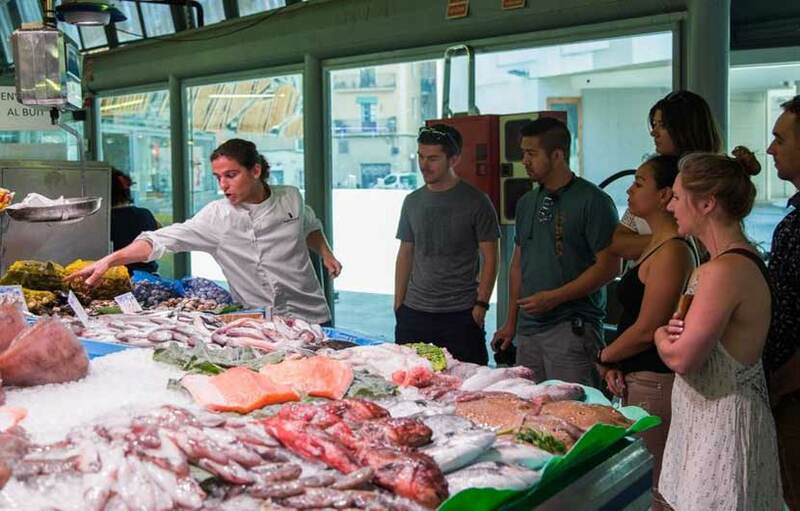 The cooking class starts off with a trip to the nearby Torrijos food market market where the chefs give insider tips on getting the best produce. 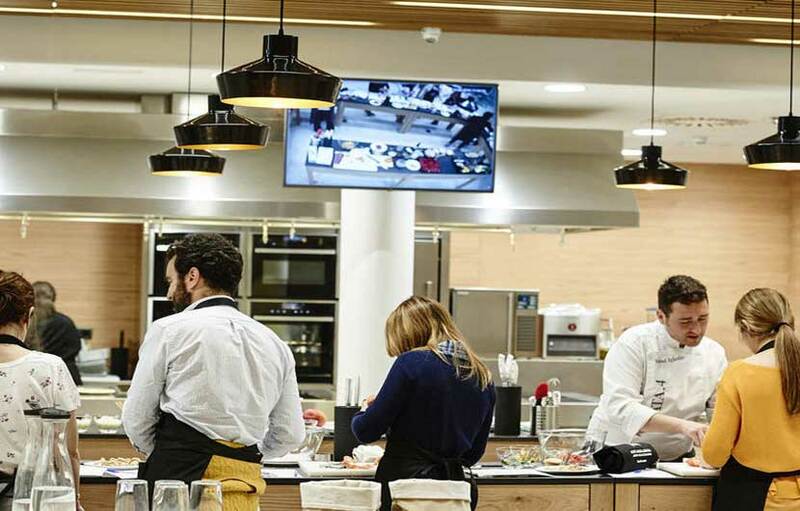 The 3 hour Madrid tapas cooking class costs £65 per person. 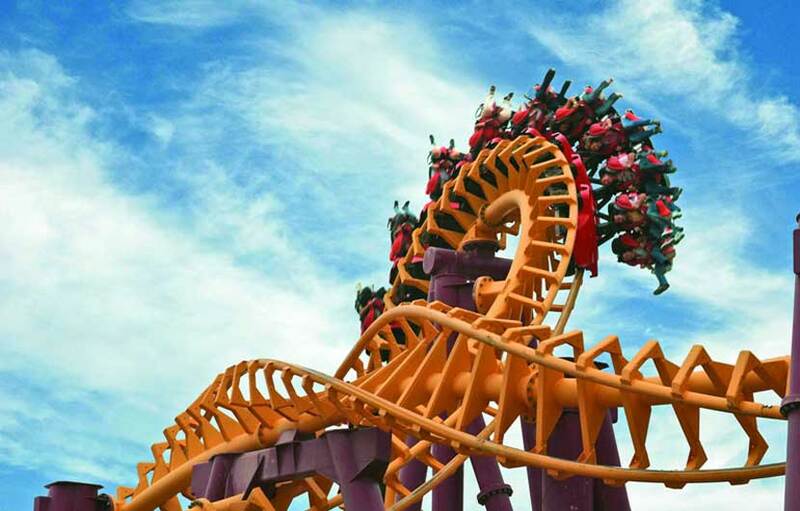 Click here for more information and book online. 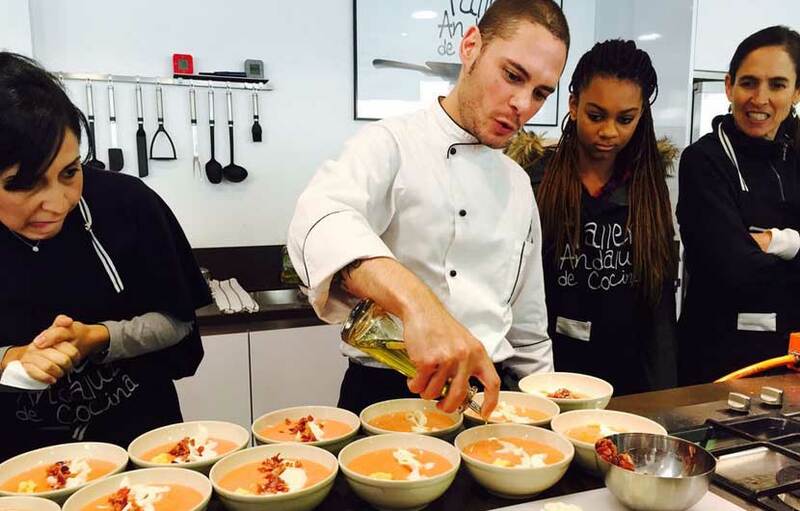 If you are looking for a Spanish cooking class in Madrid this is for you. 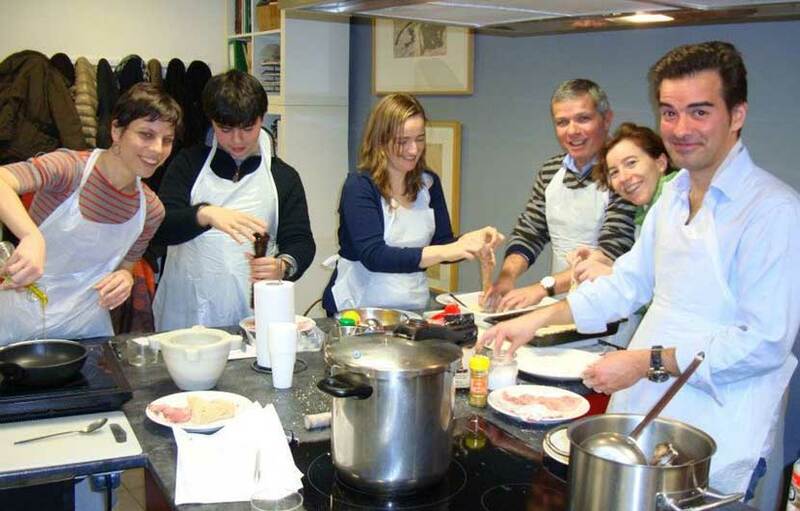 The Cooking Point cookery school is located in the Barrio de Huertas district in Madrid, an historic area which was home to Miguel de Cervantes and Lope de Vega. 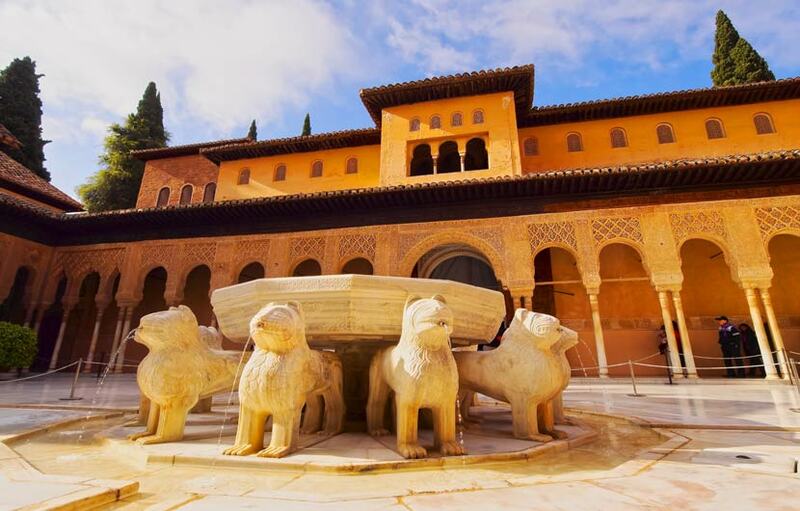 The school is close to famous Madrid landmarks such as Museo del Prado or Puerta del Sol. 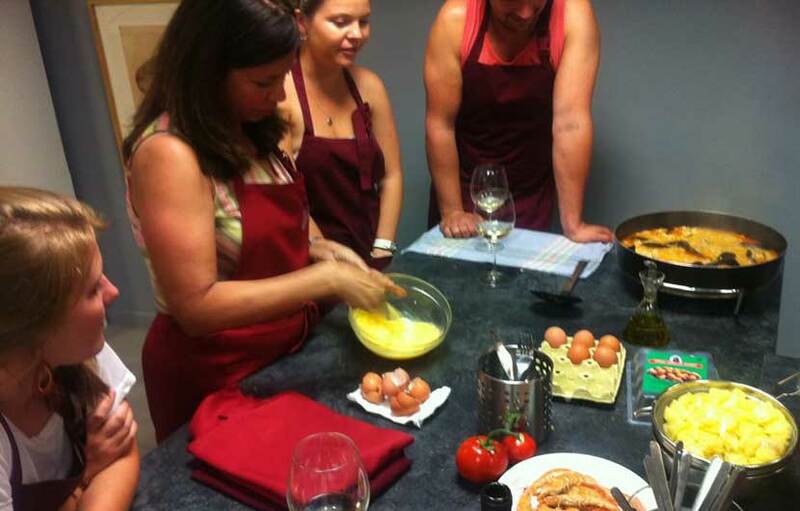 Cooking point offer well run cookery classes where you can learn how to cook Paella, Tapas and other popular Spanish dishes. The classes are taught in English and are designed for people visiting Madrid who wish to be immersed in the Spanish gastronomical culture. Throughout the class, the chefs give informative advice and information on the ingredients and traditions of Spanish food. Once the food is cooked you will enjoy a sit down meal where you can share your experiences with your cooking buddies. The classes are offered to the young and old, foodies and passionate cooks, everyone is welcome to their hands-on, informative classes. 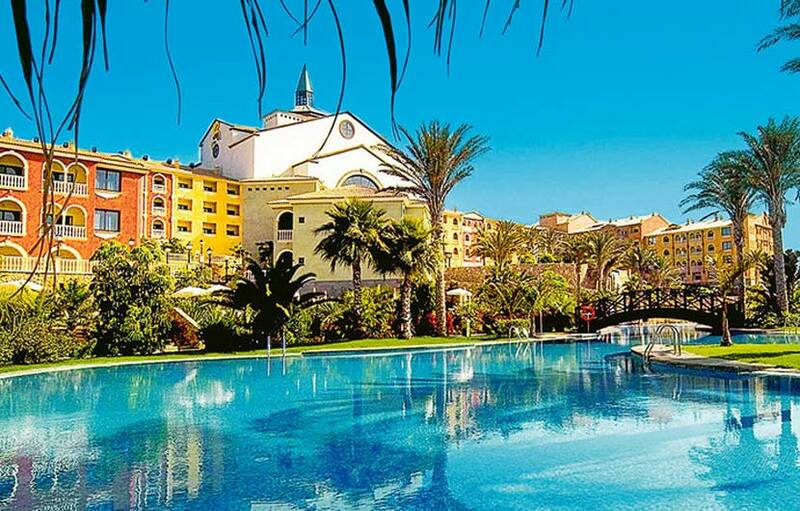 The 4 hour Spanish dishes and sangria cookery class costs £63.99 per person, click here for more information and book online. 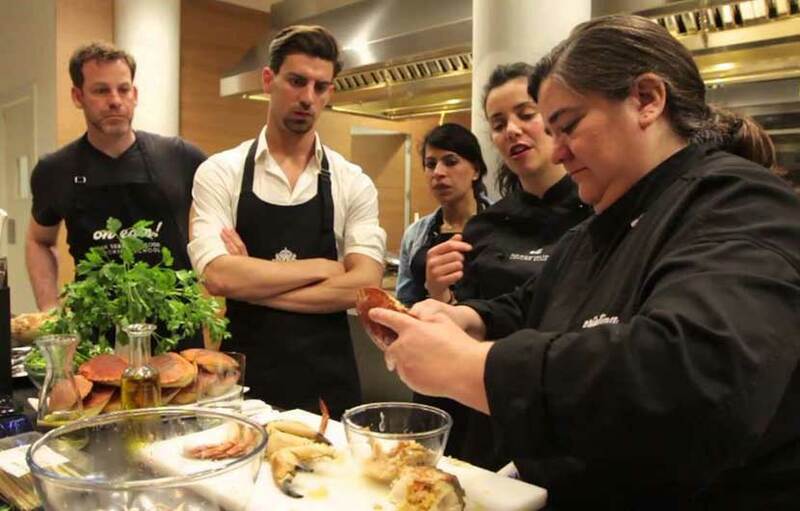 Gourmet Madrid run popular cooking classes from Monday to Friday. 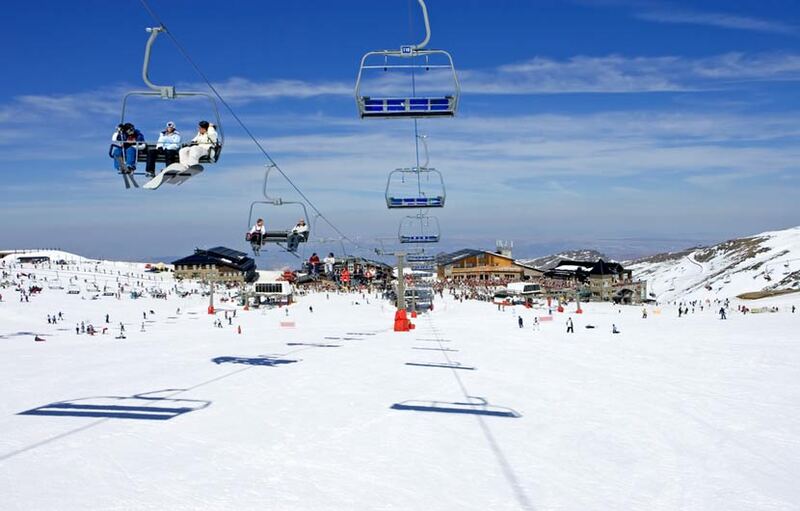 They are located close to the Torrijos Market in the trendy Salamanca neighbourhood of Madrid. Their cookery class runs for 3 hours from 12 noon to 3pm and is usually for groups of 12 people. 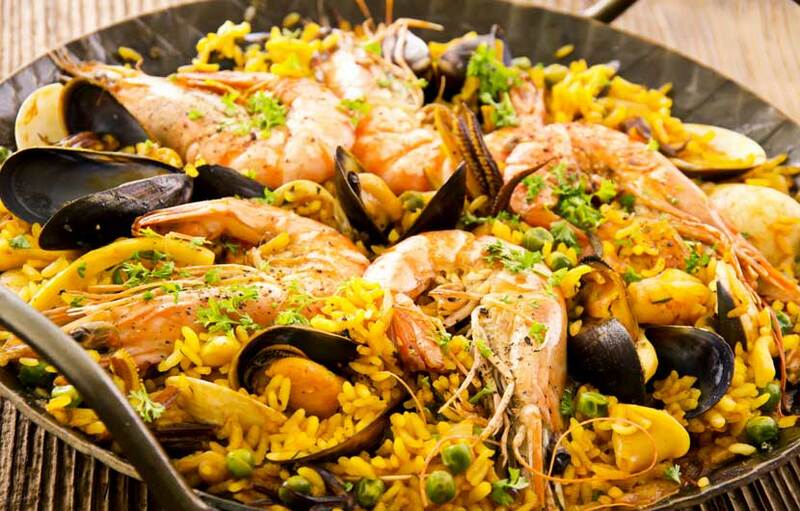 Here you can learn how to cook Spain's most famous dishes which include Paella, Spanish Omelette and Sangria. After the class you will enjoy a well deserved lunch with your prepared dishes, paired with different Spanish wines. The cooking class is lead by an expert bilingual (English/Spanish) local chef. The 3 hour cookery class costs £63.99. Click here for more info and to book online. A Punto offer a popular two and half hour cooking class where you will learn how to make 10 different tapas from the regions of Spain, enjoy a meal of your prepared dishes paired with Spanish wines and get personalized attention from a professional chef. 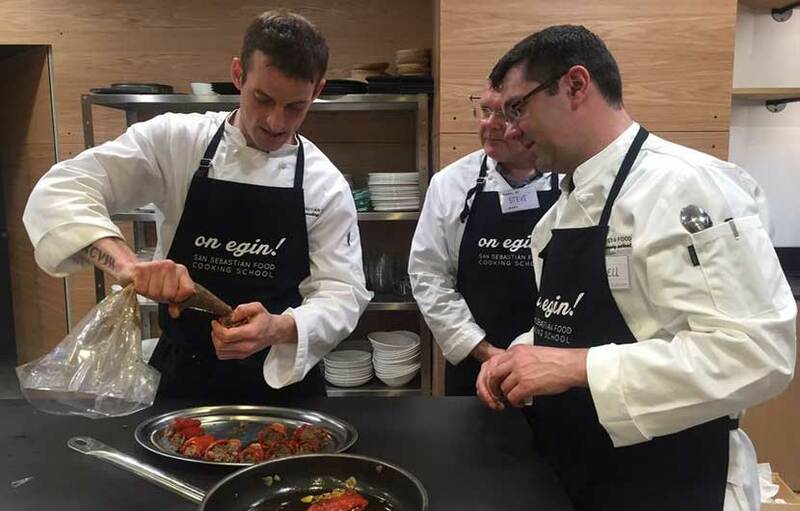 Make authentic dishes such as gilda (pepper and anchovy skewers) from the Basque Country and pan tumaca ( Bread with Tomato ) from Catalonia.This very enjoyable cooking experience costs £54.85 per person which offers very good value. 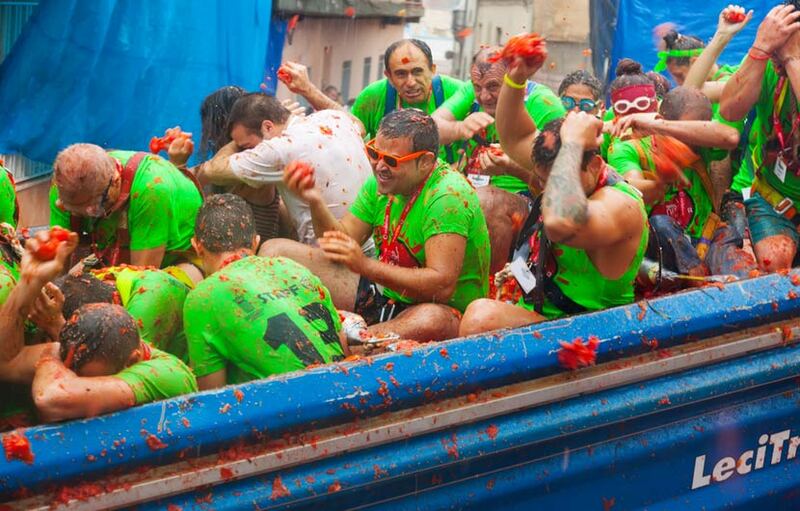 Click here for more info and to book online. 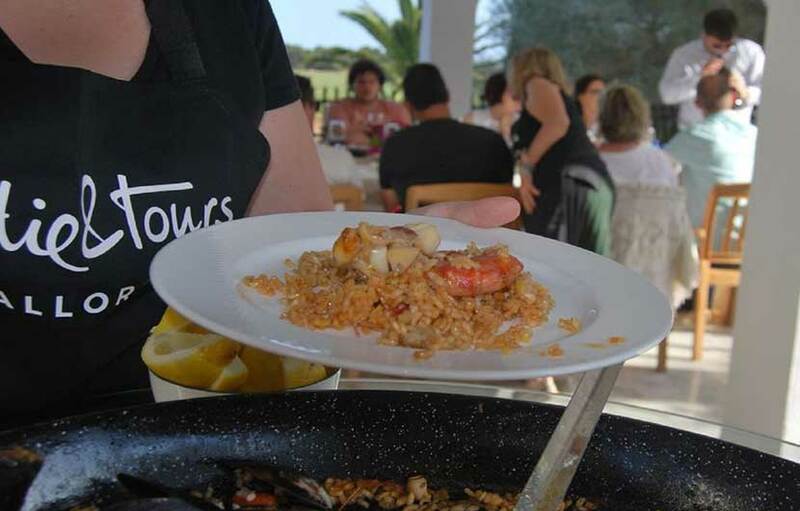 Learn how to cook Paella, Valencias most famous and recognisable dish, at the Tour Advisor cookery school. This is your chance to get to know one of the most iconic Spanish recipes using fresh ingredients and with the help of experienced chefs from Valencia. This cooking class is a fun, tasty and unique experience. 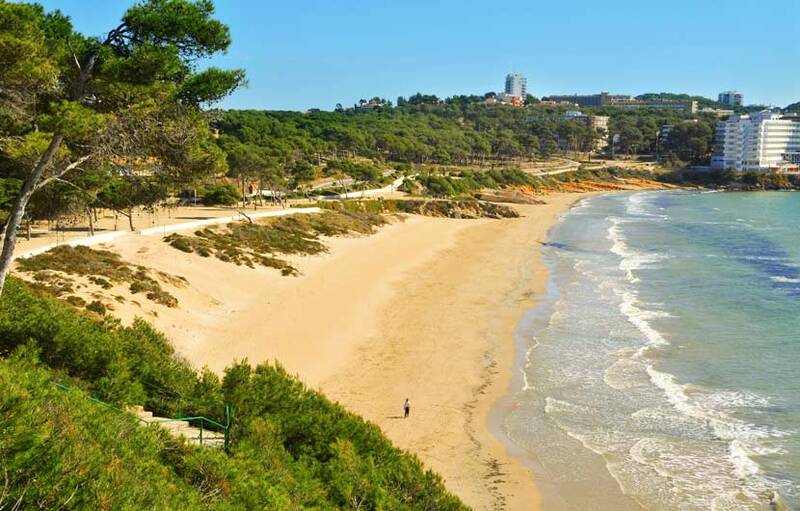 Discover the traditions around Paella in a magnificent location just a few kilometers from the city of Valencia. There are also savory appetizers to try made with typical local products. A Taste of Spain is a local travel agency specialized in organizing private culinary tours and activities across Spain for international foodie travelers and food professionals.Their cooking classes offer the added bonus of being held at some very special venues, such as a members-only Basque Gastronomic Society, a penthouse with magnificent views, a delightful beach house by the Mediterranean, a wonderful rustic kitchen in a country home, a cozy professional kitchen and within a prestigious local cooking school. 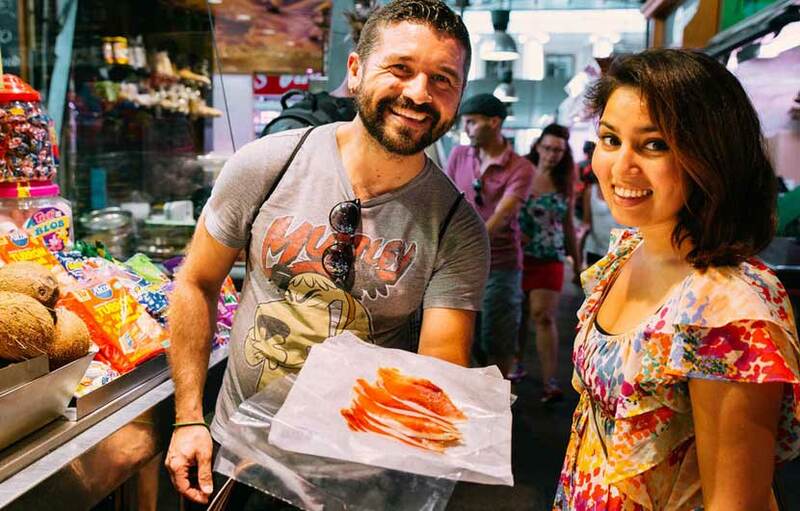 Their most popular cooking tour is the ultimate foodie tour of Spain which takes in San Sebastian, Madrid, La Rioja and Barcelona. 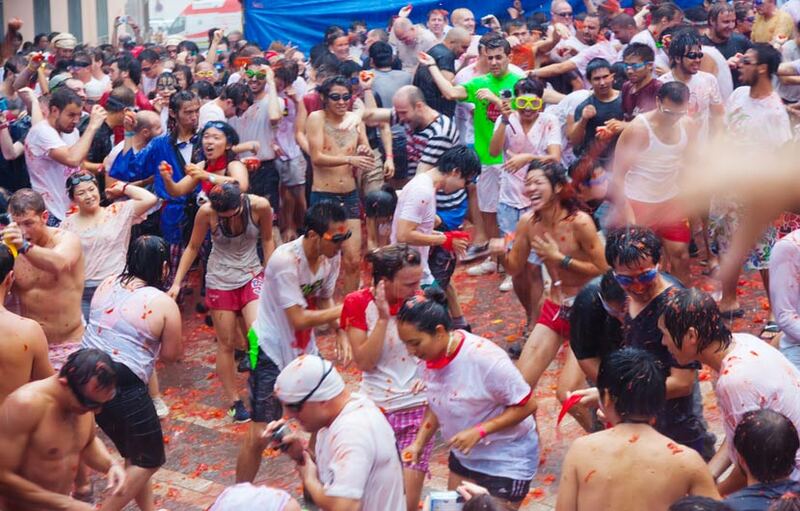 Visit the Taste of Spain website for more details. 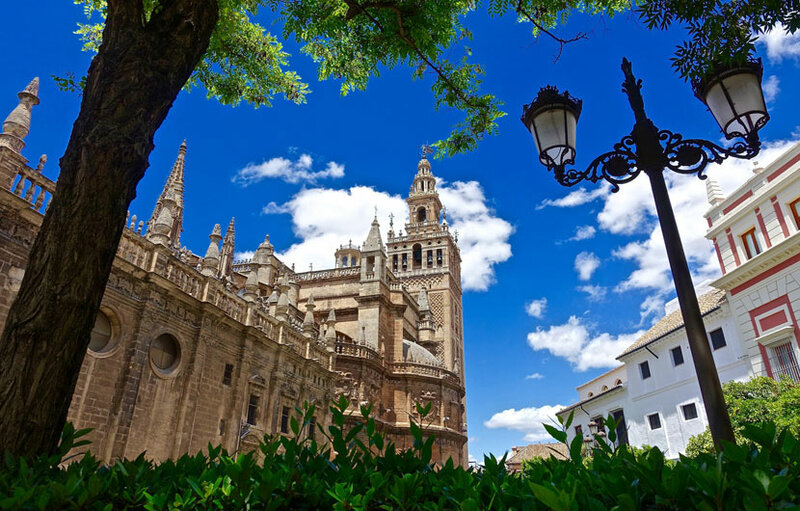 The Seville based tour company Not Just A Tourist run this exciting Spanish tapas cooking class. 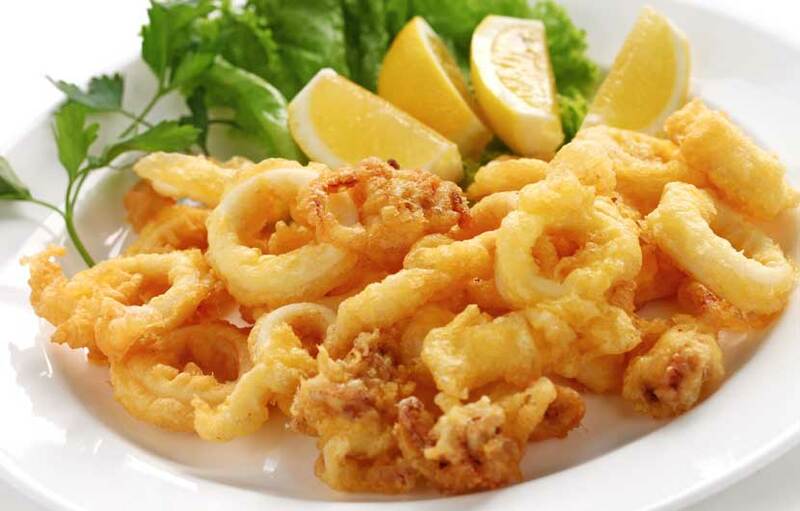 The 3 to 4 hour class will teach you how to prepare and cook an authentic 3-course Spanish meal. 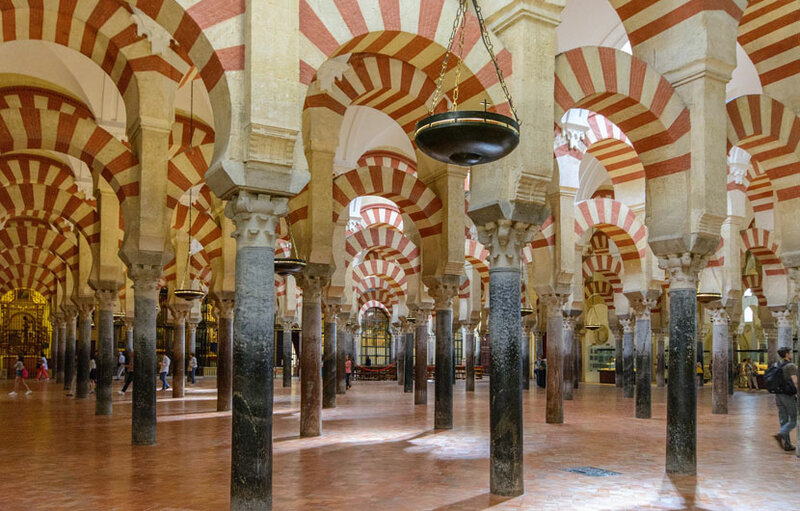 Local Andalucian dishes are a mixture Middle Eastern, Mediterranean, and European flavors, and here you will to sample some of the region's simple, mouth-watering recipes. The cooking class starts with a visit to a lively local market to purchase in season ingredients, then its back to class which is held in a traditional space in the heart of the old town that has been turned into an art gallery and co-work space. 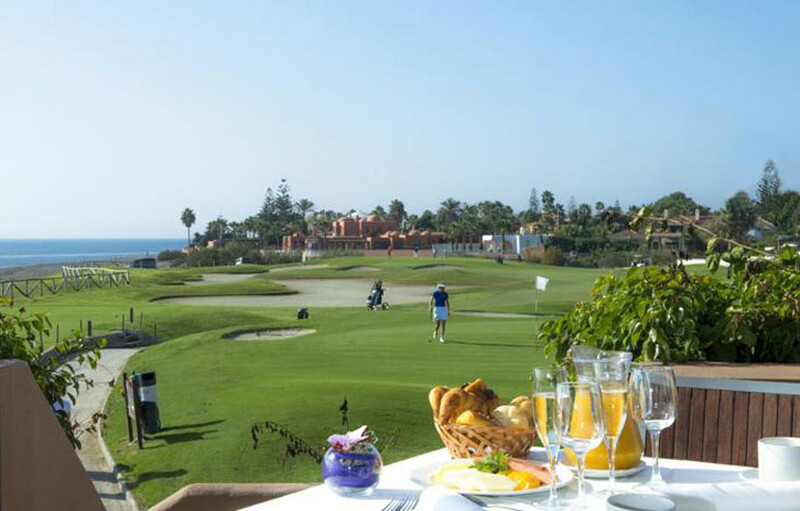 The menu is adjustable to your taste and preferences, but can include salmorejo (a purée of tomatoes and bread), or gazpacho as a starter, spinach with chickpeas, tortilla de patatas (Spanish omelet), or gambas al ajillo. 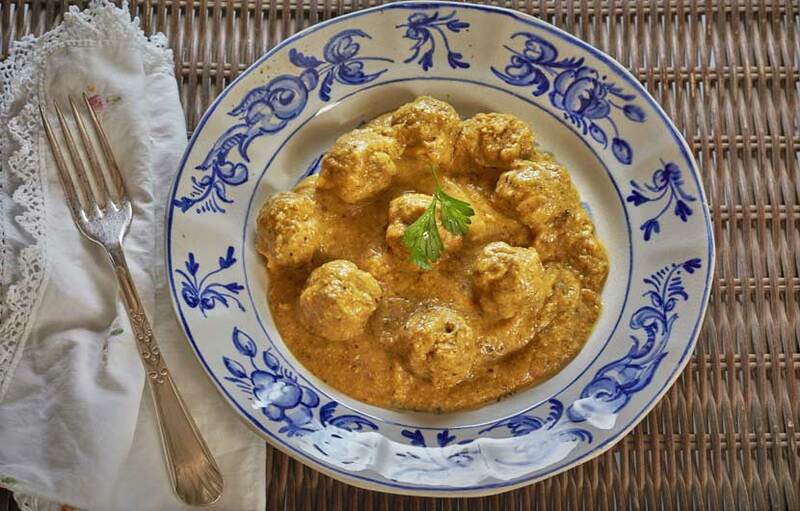 Try something different on your visit to Seville and learn how to cook classic local dishes. 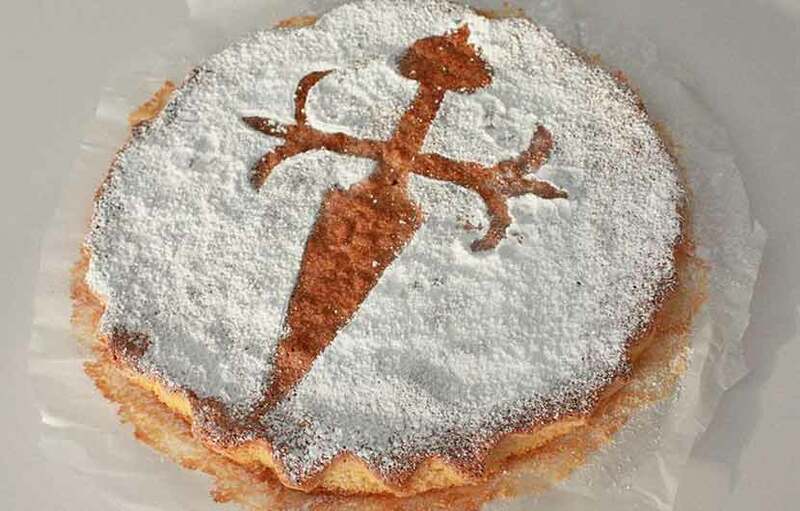 Run by Taller Andaluz de Cocina who offer a hands-on Spanish and Andalusian 3.5 hour cooking class following a tour of the vibrant Triana Food Market in Seville, the best place to get the freshest local ingredients. 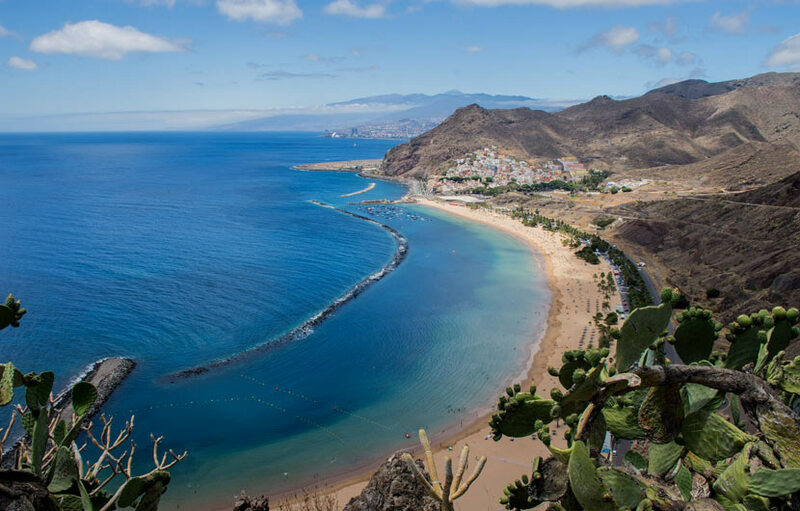 Learn how to cook classic local dishes which include Salmorejo (chilled tomato soup) or gazpacho, Spinach with chickpeas or huevos a la flamenca, Paella, as the main course and a light dessert (such as lemon sorbet with cava). A professional chef will teach you how to cook these famous traditional dishes which is both educational as well as entertaining. 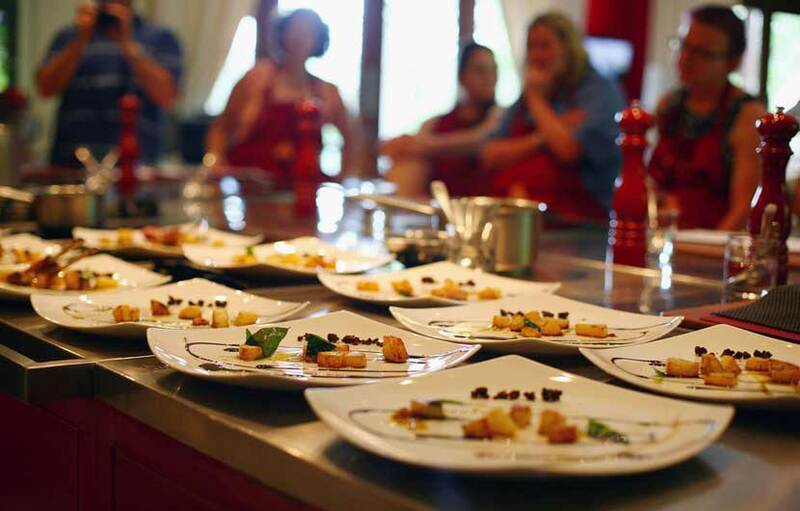 The price of the 35 hour cookery class run by Tour Andaluz de Cocina is from £54.85. Toma & Co are based in an old farm house in the foothills of Malaga. 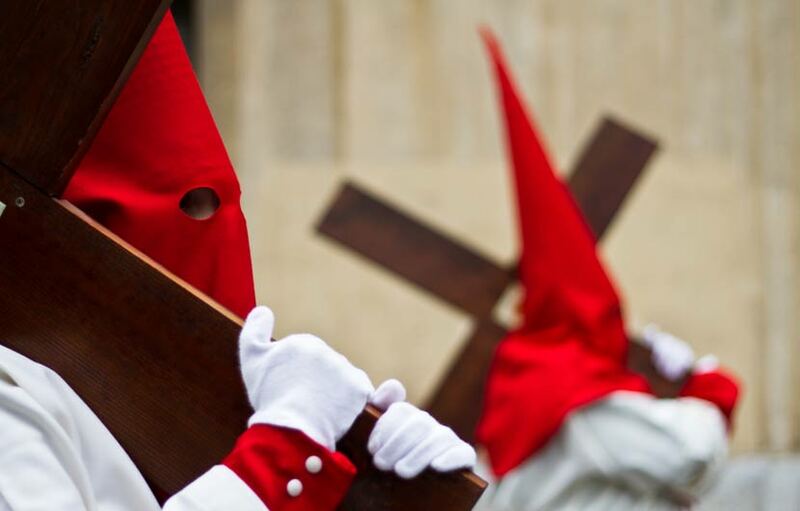 Enjoy a tour and cooking experience which includes a shopping trip to a local farmer's market where you will learn about the fresh produce, then spend the day in an idyllic rural setting, far from the city´s hustle and bustle where you will learn how to create a selection of some typical Andalucian dishes. Visit the Toma & Co website for more details. 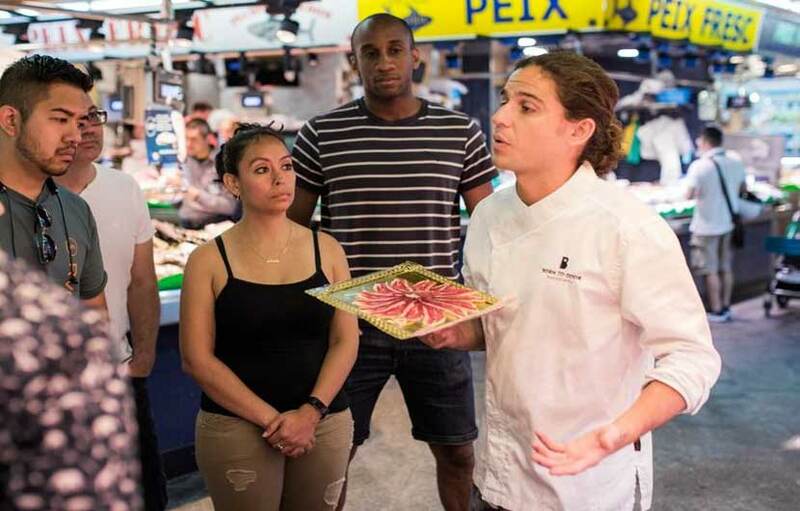 The Paella Club is located close to the famous Boqueria food market in Barcelona, a perfect setting for a master class in Paella and authentic Catalan cooking. This popular cooking school boasts that visitors who join their classes are not made to feel like tourists, which they do very well. The Paella Club is the brain child of renowned chef Alex Betolaza and aptly aided by Executive chef Alex Villar. 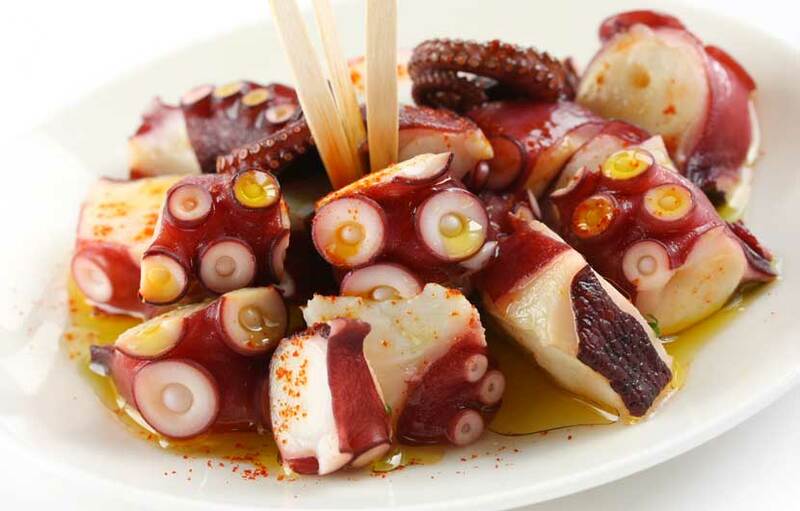 Learn about Spanish culture by its's divers gastronomy with Discover Madrid Concierge . 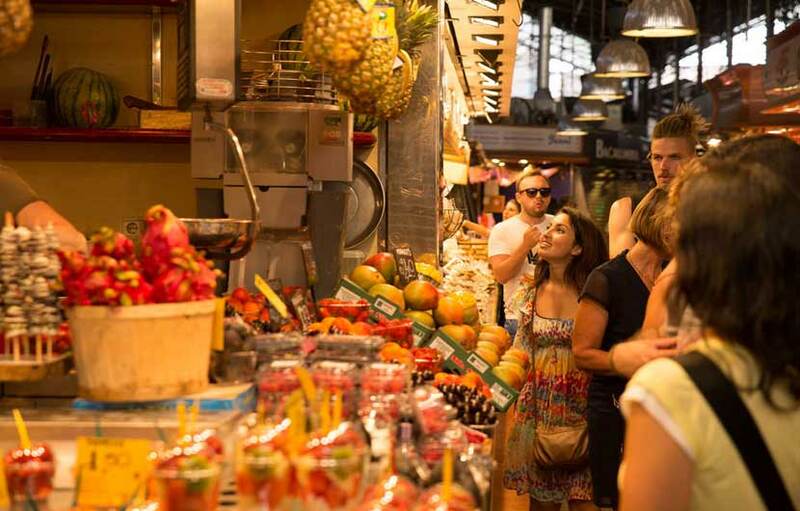 The tour and cookery class starts with a shopping tour in a well know fresh food market to buy local products as well as walk around the vibrant La Latina neighborhood of Madrid. 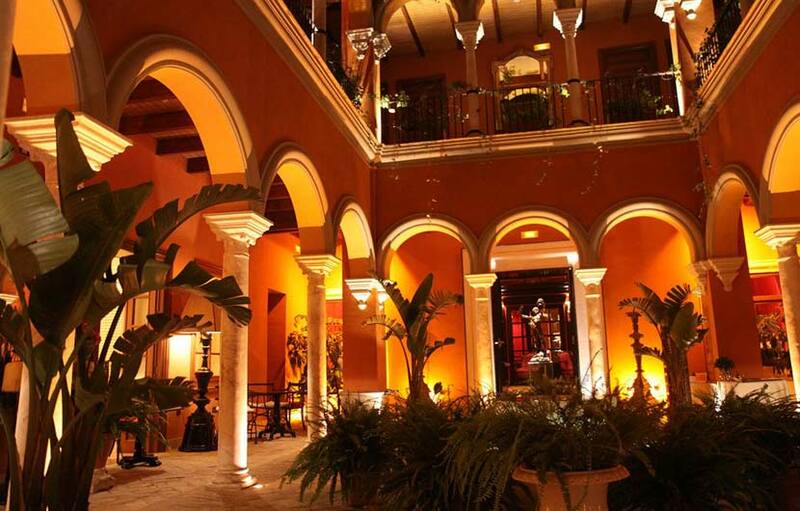 Then join your cooking class with a professional chef in the very center of the old city. Here you will be able to learn how to cook a selection of delightfully typical Mediterranean recipes, plus a tasting of each dish. Then it's a sit down lunch with your cooking buddies to enjoy the food you prepared and all washed down with a good glass of wine or two. The chef gives lots of tips on the top restaurants and tapas bars all over Madrid s well as informative information and stories about Spanish food and it's history. 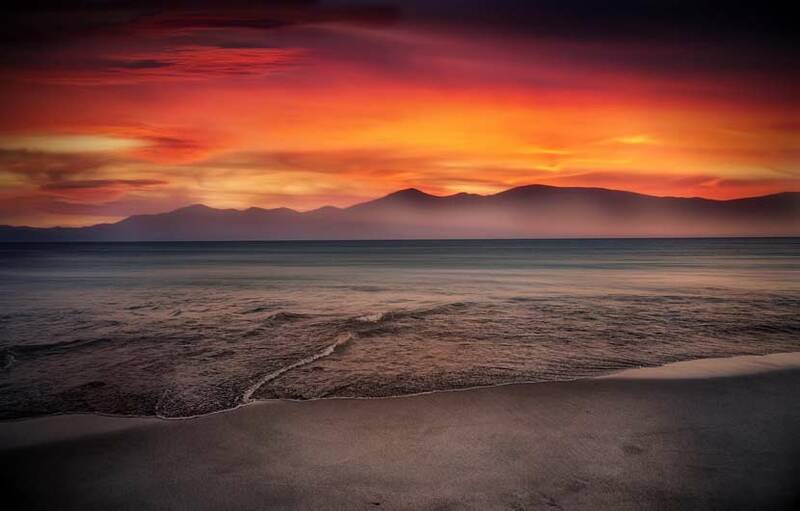 Click here for more info and to book online. 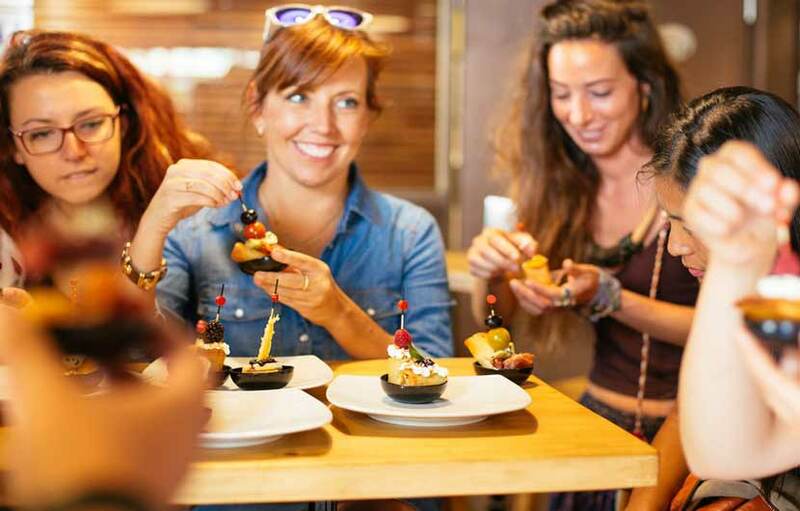 Foodie & Tours are based in Mallorca and offer tailored small group and private gastronomic experiences led by passionate local guides. Each well planned cooking class has been designed to test all your senses whilst offering an insight into local food culture. 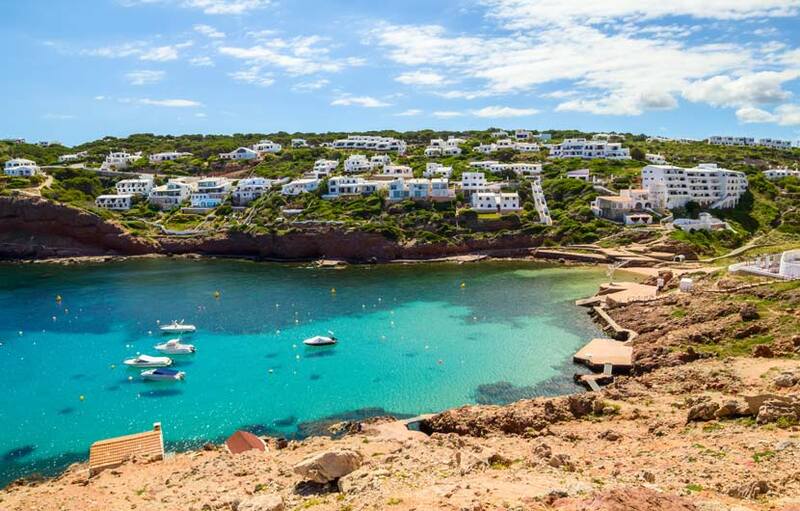 The 3 hour midday seafood paella cooking class includes a visit to a charming neighborhood with your guide, a wine tasting experience of some of the finest wines produced in the region and Paella cookery class with typical starters. 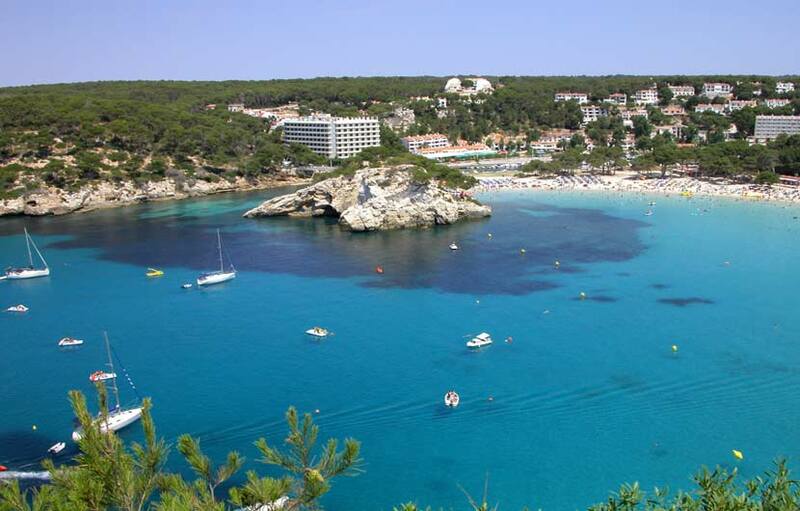 The cooking class will take place in Llucmajor, the highest village in Mallorca, only 18 kilometers away from Palma and with phenomenal views of the sea. You will learn how to cook a delicious seafood paella with the freshest materials purchased from the market in the morning. The 3 hour class is priced from £77.70 per person - Click here for more info and to book online. 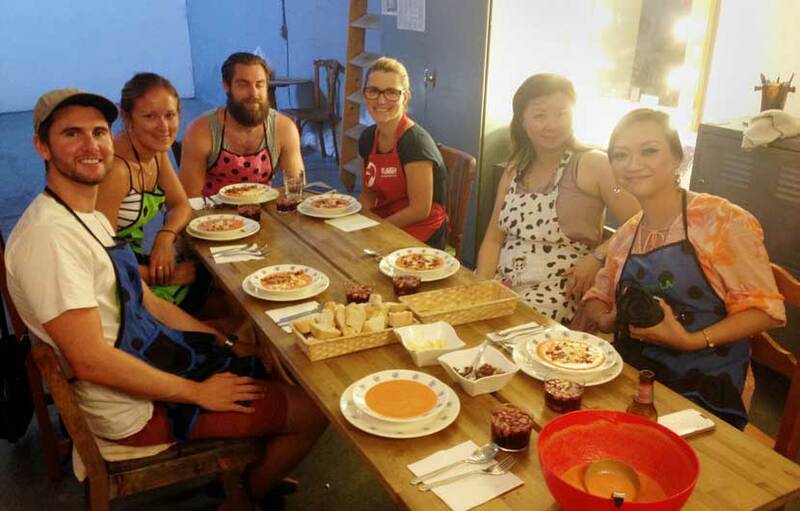 Learn how to prepare traditional paella in Valencia and enjoy a full lunch with your friends and cooking buddies. 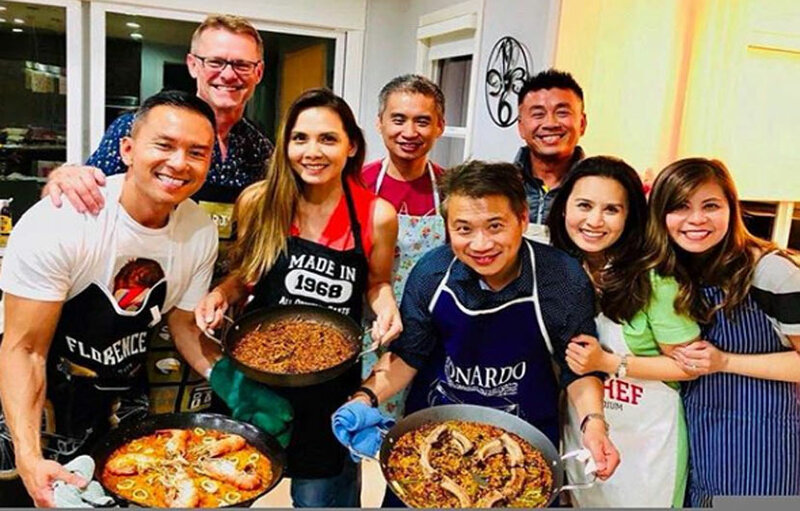 Paella is most recognisable dish in Spain however there are so many ways to prepare it, on this 4 hour cooking class you will learn not only how to cook a traditional Paella but will learn what makes this dish so special at a social level. 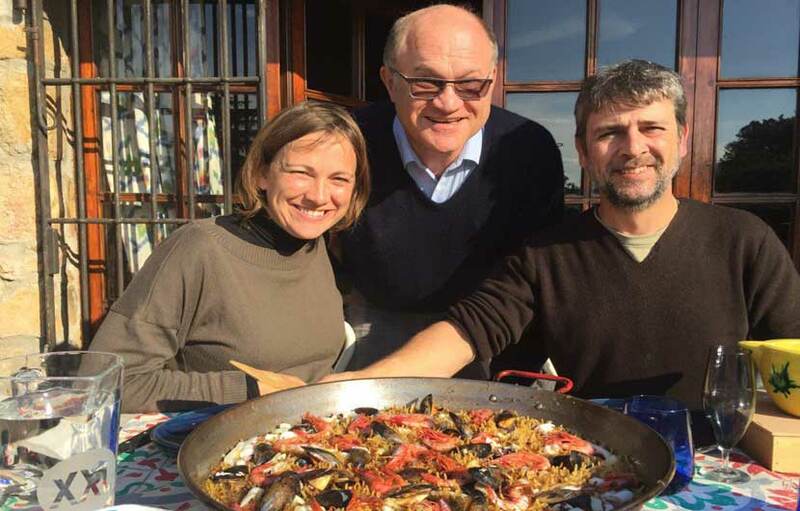 The Paella cooking class is held in a family run farm house in Valencia and includes learning to prepare a traditional paella recipe passed down the generations, once cooked you will be able yo enjoy the dish with red wine and beer then take the recipes home to surprise your family and friends. 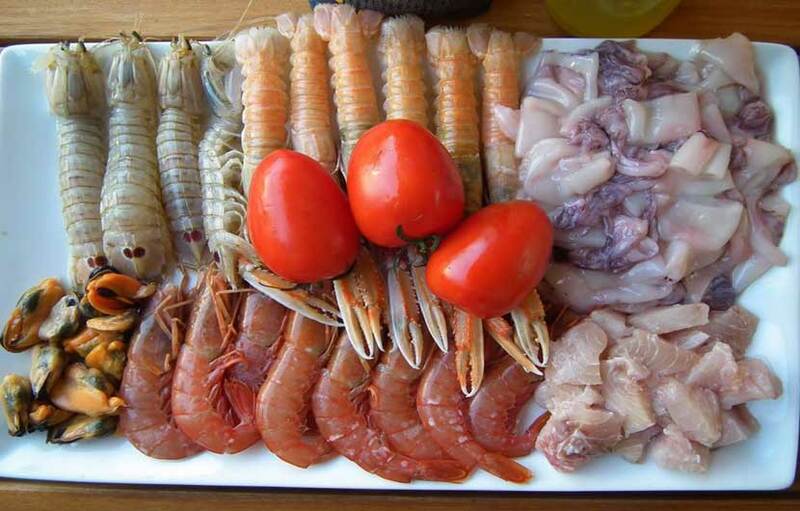 The 4 hour traditional Paella cooking class with lunch in Valencia starts from £78.62 per person. 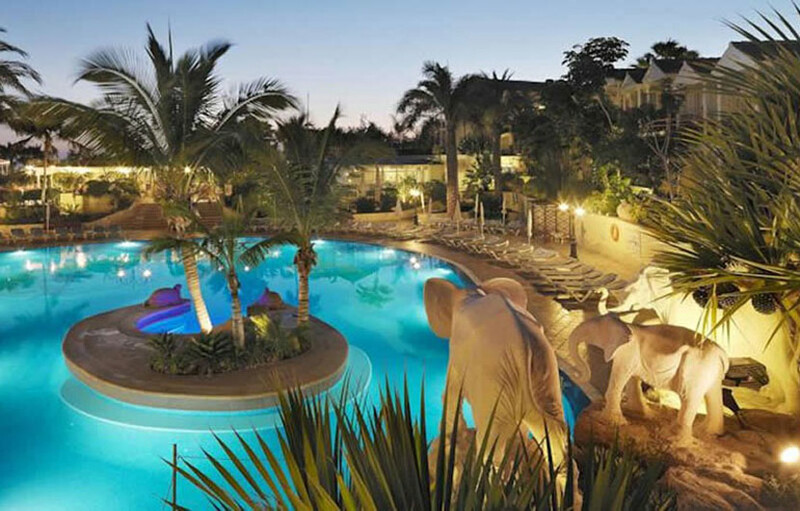 Click here for more info and to book online. Nuria, founder of A La Taula offers cooking classes in Barcelona, in a spacious renovated kitchen full of the typical architectural details of a 19th century Barcelona apartment building. She grew up in Barcelona with a family that had passion for food, her mother made wonderful meals every day and she also spent much of their time traveling around Catalonia to try different restaurants. 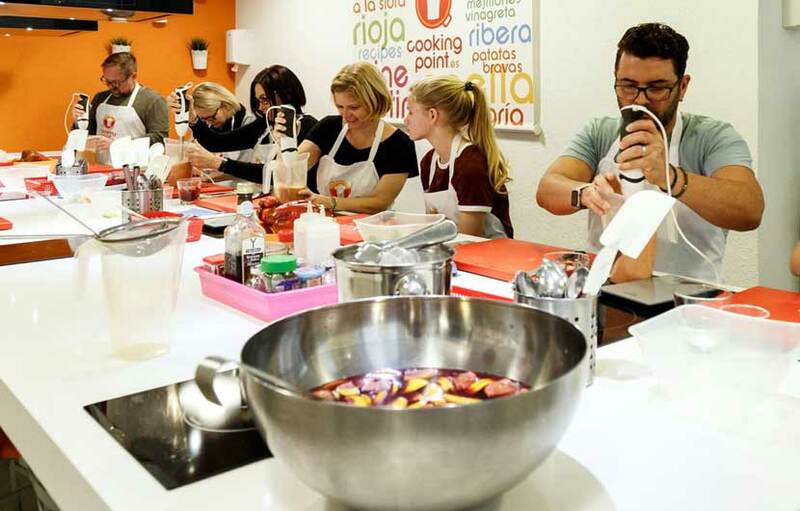 Nuria now runs popular half-day cookery classes, during which a main meal is prepared, 2 fresh market tapas dishes and a dessert. The ingredients used are always high-quality, seasonal, fresh, local and organic when ever possible. 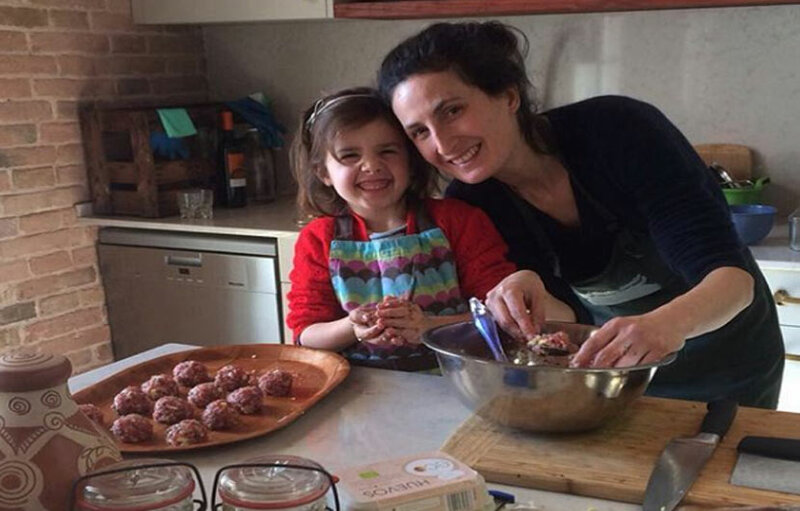 Nuria shares her favorite family recipes, which have been tweaked with her own special touch. 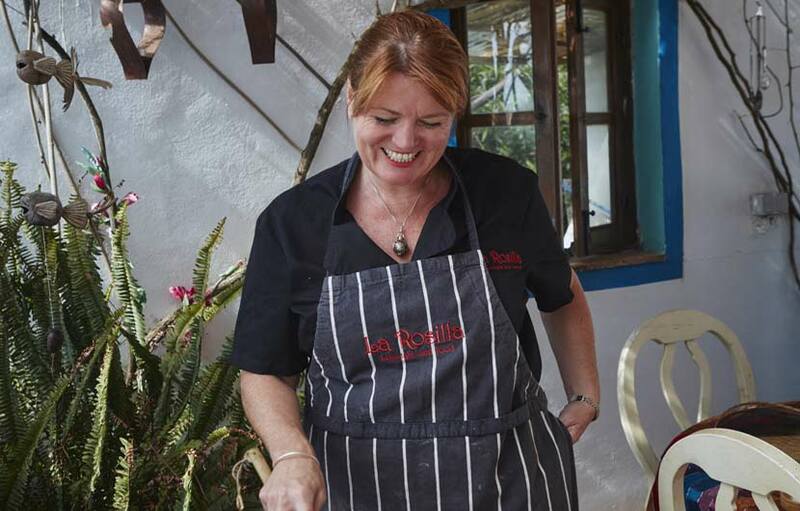 La Rosilla is run by Lynsey Drake, originally from the UK she relocated to Spain 15 years ago to live the dream and has not looked back since. La Rosilla is a charming country home located in the mountains of Malaga in the beautiful Axarquia region of Andalucia. 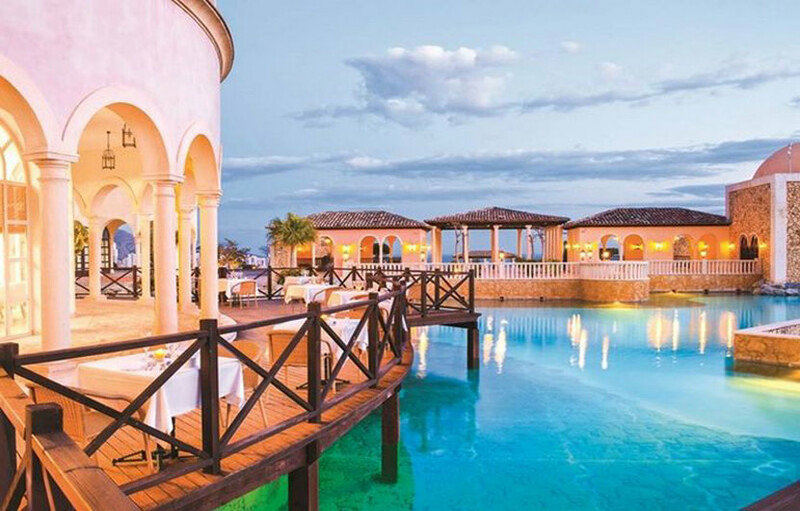 Lynsey runs an event and private party catering business, a supper club and chefs table as well as cooking vacations in Spain. You can spend a fun filled day at La Rosilla learning, tasting & cooking Paella and local dishes to impress friends on your return home. And for authentic cookery experience try the Finca Bueno Vino run by Jeannie and Charlie Chesterton. 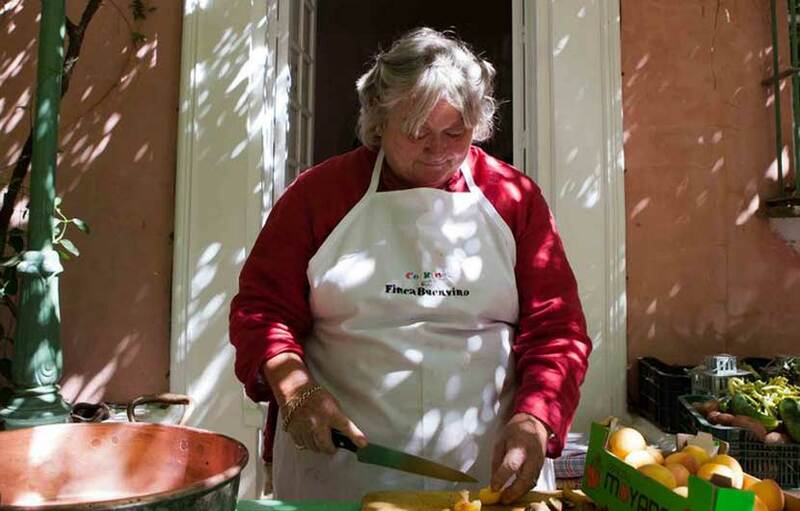 Set in a charming finca in Aracena near Seville in Southern Spain, Jeanie and Charlie run several cookery course each year where you can learn how to cook authentic Andalucian and national dishes in a warm and friendly atmosphere. 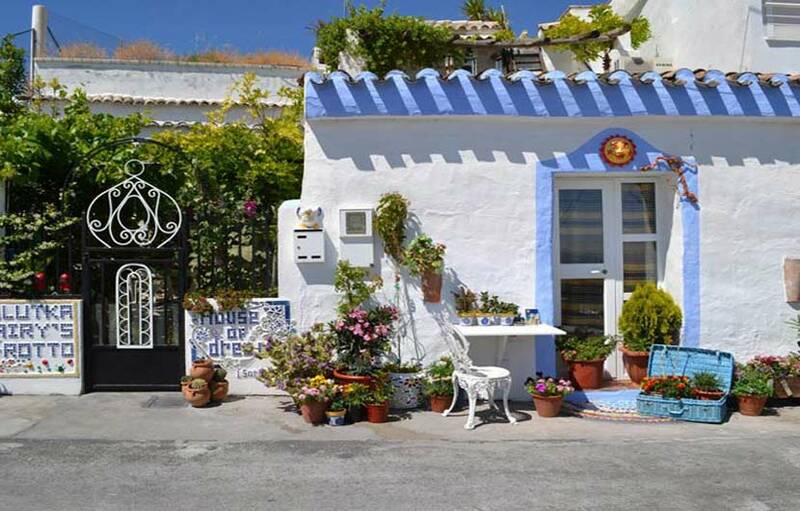 If you fancy learning to cook real Spanish dishes in an authentic Spanish village atmosphere then we would highly recommend Annie B's Kitchen based in Vejer in Andalucia. 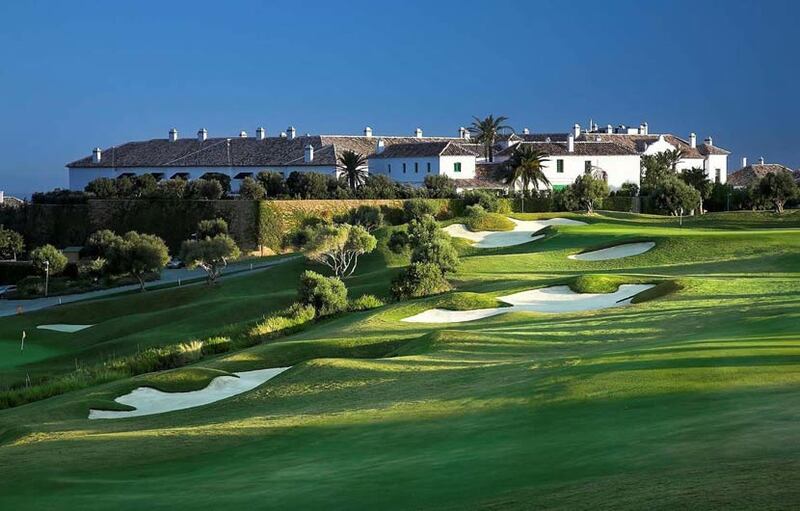 Annie B is located in the very typical Andalucian village of Vejer de la Frontera. Her classes revolve around quality local sourced ingredients prepared with love and dedication in a relaxed atmosphere. 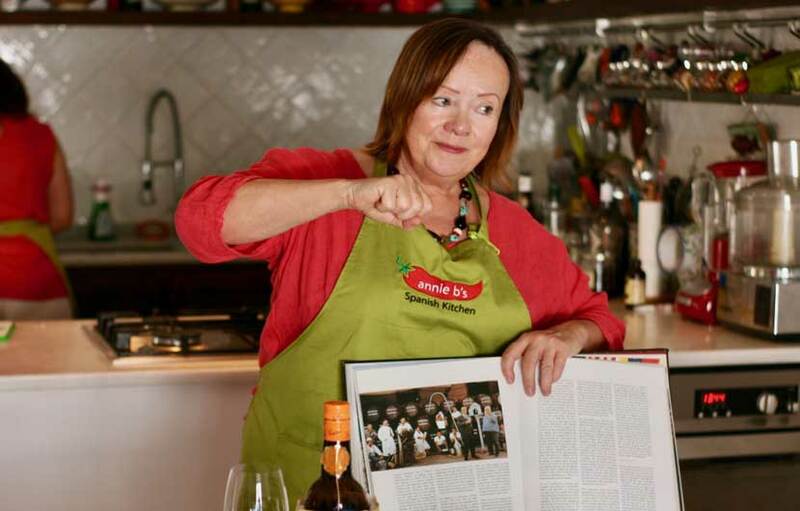 If you plan to visit Andalucia and are a keen to learn to secrets to cooking amazingly delicious Spanish food then Annie B's cookery classes are well worth visiting. 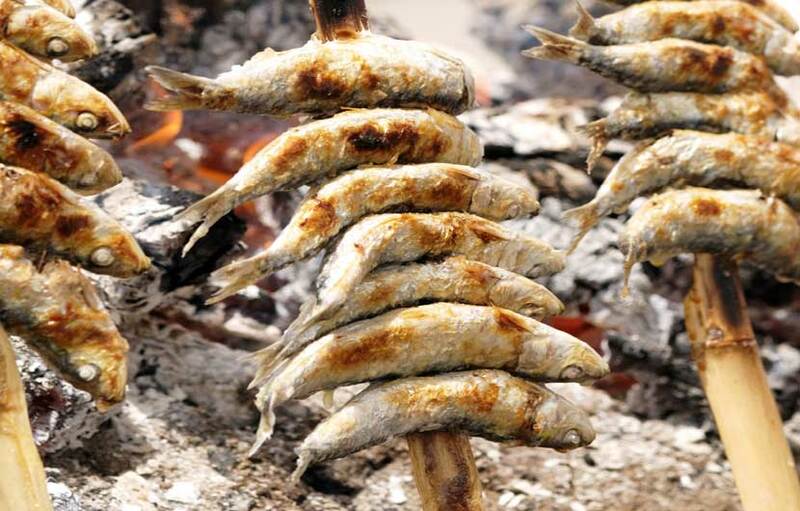 » See more about traditional home cooking courses in Spain.